The 17" Palestine Elephant Print boot from our Hero collection pays tribute to the spirit of the Southwest, with intricate stitching on a new high-tech sport mesh shaft that's lightweight, breathable and flexible. 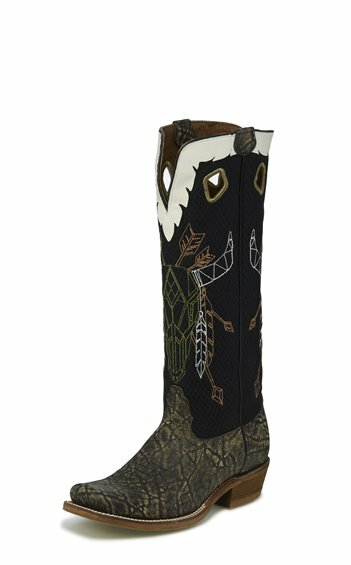 The black mesh shaft is crafted from an ultralight 3-D textile often found in athletic shoes that's extremely durable and abrasion resistant and designed to keep legs cooler than all-leather boots. It's paired with a Saddle elephant print leather foot with a weathered, aged patina. This boot is equipped with an orthotic insole for comfort and features an extended half moon toe and 1 1/8" buckaroo heel with spur ledge.